River Rock is a natural rounded stone, with distinctive smoothness and colors. Centuries of moving glacial waters and shifting streambeds created this beautiful rock. 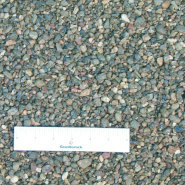 Classic terrigenous sedimentary rocks consist of rock and mineral grains, or clasts, of varying size, ranging from clay-silt and sand up to pebbles and cobbles. These clasts were transported by gravity, mudflows, or running water, and eventually deposited in various settings in desert dunes, creek beds, streams and continental shelves. The term is also commonly used to describe paving stones, usually of granite composition. 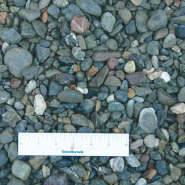 River Rock edging materials include ashlar and small building stones.